Monster-human violence is at a breaking point. In response the US government has created Unit-M, an extra-governmental team of Monsters to meet the crisis and stand against prejudice. Isn’t This Kind of Derivative? No one has ever done a comic about a team of superheroes struggling in a world that fears people with powers. Ever. This idea is 100% original. This is my first comic. My first time writing scripts. My first time using DAZ 3D Studio. I wanted to start with a few basic, low stakes scripts to see if I could actually make comics with DAZ and Clip Studio Paint. I have a lot to learn and small, contained stories, such as the first two I’ve posted, seemed like the best way to start teaching myself the basics. I have a story arc sketched out and draft scripts now written for two issues, so, hopefully, once I get better at this, more meaningful stories will be on the way. With the power of hindsight, I’ve slowly been adding commentaries to the pages of my first issue of Unit-M. Interested in reading about my endless battles with the lighting system in DAZ? Want to see me freak out over every error I missed before I hit publish? Want to learn why I still keep working on mini-issues and may never actually complete issue #1? Then waste your time and check out my growing collection of commentaries! 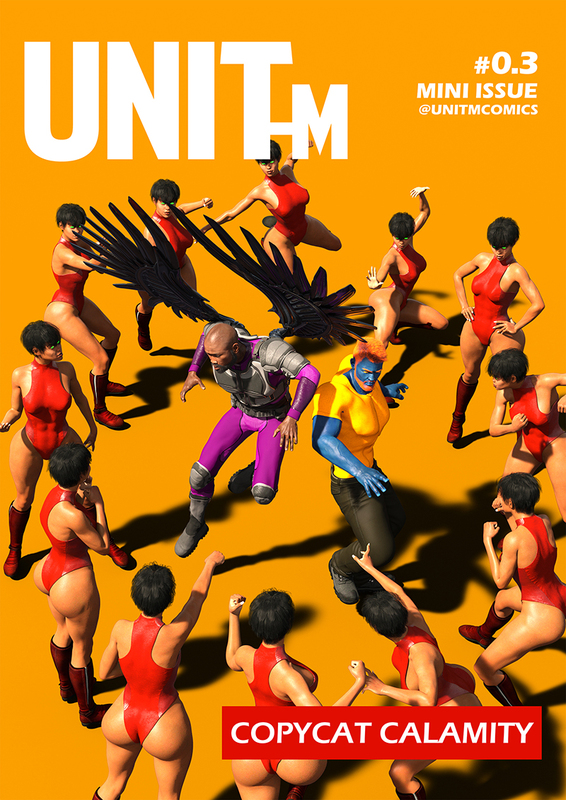 The first page of Unit-M Issue #0.2, Hashtag Hell, is now online. I'll be posting new pages everyday from now until February 22, when Issue #0.2 concludes. Monsters are real. Monsters are feared. Monsters are threatened. Much to her distaste, Unit-M’s Second-In-Command, Shield, has been instructed to join social media to boost public relations. Check out Issue #0.2: Hashtag Hell. We're on the 5th day and therefore the 5th page of Hashtag Hell. New pages will be posted daily until February 22 when this issue concludes. Welcome to day 7 of Hashtag Hell. Social media, as Danielle (Shield) has learned, is full of misogynistic basement-dwellers that make a sport out of harassing women and Monsters. 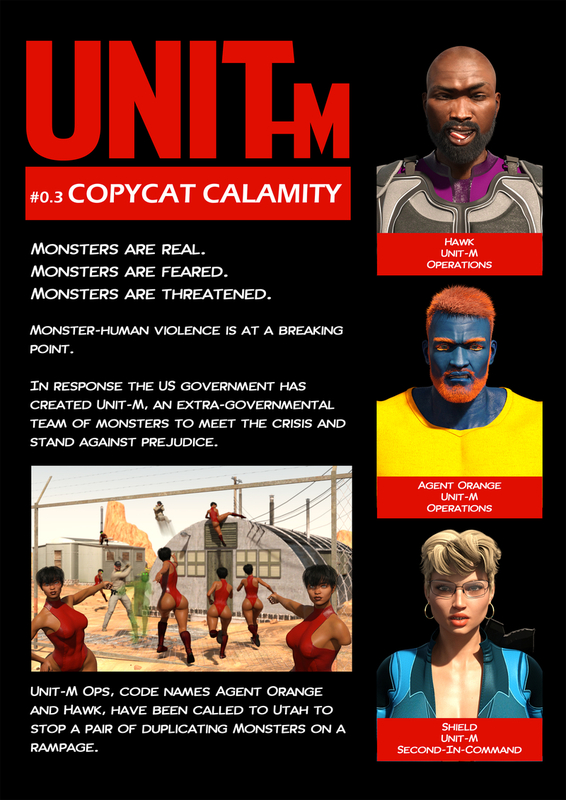 Issue 0.3 of Unit-M, Copycat Calamity, starts today. New pages will be going up on Mondays and Thursdays for this issue. Unit-M Ops, code names Agent Orange and Hawk, have been called to Utah to stop a pair of duplicating Monsters on a rampage. Check out Issue #0.3: Copycat Calamity. Continuing issue 0.3 of Unit-M, Copycat Calamity with a story preview and character introduction page (totally not boring!). And, hey, we’re finally meeting some new members of the team: Agent Orange and Hawk. We finally meet some new members of Unit-M as we see the first panels of Issue 0.3, Copycat Calamity. Shield briefs Agent Orange and Hawk about the Monsters they're after: The Copycats, twin sisters that can create hard light duplicates of varying sizes. Shield also shuts Hawk the f--- down. 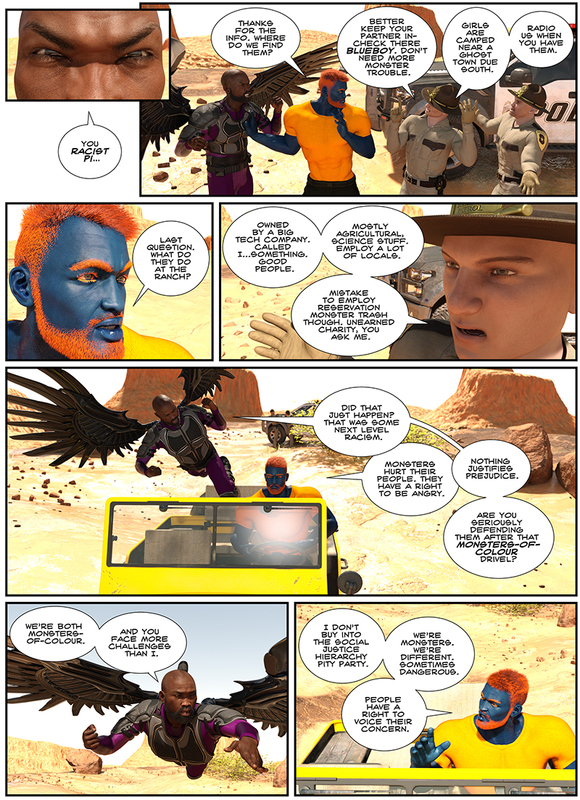 Agent Orange and Hawk meet some local cops whose opinion of Monsters is less than enlightened. The cops finally tell Hawk and Agent Orange where to find The Copycats (the Monsters they’re after), but not without some more casual racism. And Hawk and Orange are still arguing...only now it’s against the backdrop of a pretty vista. Hawk and Orange have found their targets, The Copycats. 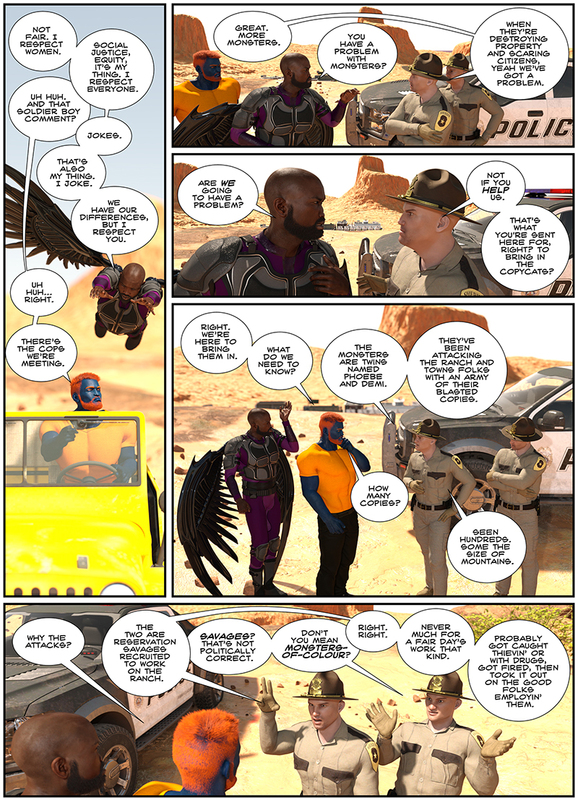 Though Hawk, after meeting those less than enlightened cops, is starting to have doubts about their mission. A 40ft tall woman lifts a house so her regular-sized duplicates can pour out of the basement. No, really. Hawk takes out one of the real Copycats, causing the duplicates to momentarily fade. We learn that The Copycats think our heroes were sent by their former employer, the mysterious Ranch, to bring them back. Something they’re none too pleased about. For me who is worlds away from ever creating a comic, it's super interesting to learn about the difficulties in unexpected corners of comic-creating. Even if I probably never make use of the things I learn for myself. UnitMComics:Want to learn why I still keep working on mini-issues and may never actually complete issue #1? UnitMComics:Then waste your time and check out my growing collection of commentaries! Mostly, this is due to the fact that I have damn lot of semi-complicated, technical-process stuff say about Page 13 of Issue #0.1 (where I left off). Hopefully I’ll post something soon. Hawk and Orange get sent on a one-way flight.